Rabat - A recent survey about happiness in Morocco, showed unambiguously that the people of the Sahara region are the happiest and the merriest in the whole country, followed by Casablanca. Rabat – A recent survey about happiness in Morocco, showed unambiguously that the people of the Sahara region are the happiest and the merriest in the whole country, followed by Casablanca. Indeed, this region since its recuperation by Morocco in 1975 by the means of the peaceful and massive Green March, big cities have sprawled from the sand dunes and Morocco has invested the equivalent of 40 billion dollars in infrastructure, almost to the tune of 1 billion dollars a year building roads, hospitals, schools, airports, ports, desalinization plants, power plants; creating heat-resistant agriculture, sand dune-stabilization programs, plant nurseries, agronomy labs, etc. Not to forget, of course, providing free housing, subsidized food, free medical care and thousands of jobs for the Sahrawi people in the region or elsewhere in the country. Morocco has, also, facilitated local and national elections in the territory, and even opened the door to the Polisario supporters to demonstrate and express their point of view openly in the major cities and for independence activists to move in and outside the country freely. 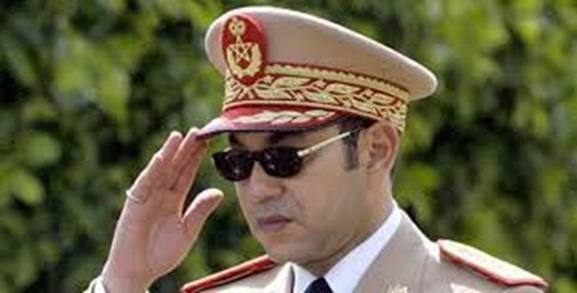 In 2006, to break the political deadlock, Morocco proposed a large autonomy (Moroccan Sahara Autonomy Proposal)[i] for the region under Moroccan flag and sovereignty. Since the late 80s of the last century Morocco built a defensive wall to protect the region and, as a result, the Polisario has been militarily paralyzed on Algerian territory living off international aid and been fully quarantined by the Algerian army, to use as a means to blackmail Morocco, when necessary. If today the refugee population of Lahmada is allowed to move freely they would all come to Morocco on foot, without hesitation. Algeria, the main support of the Polisario, is incapacitated. Its president, Bouteflika is in a wheelchair unable to move or for that matter even to speak, since some years ago after a heart attack. Now the Front de Libération Nationale -FLN-, state party and mouthpiece of the omnipotent and omnipresent army is asking him to be the official candidate of the military establishment in the upcoming presidential elections, for a fifth term on a row. Of course, it is the army that will rule, as ever, with its 40 generals in the command behind the incapacitated president, to embezzle, as ever, the little money that is left in the country and place it in Swiss bank accounts. 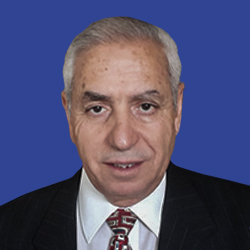 Algeria has built its political survival partly on declaring its animosity to Morocco since the time of President Boumedienne and created for this purpose an organization called Polisario to hinder Moroccan development and progress. But much to its dismay, Morocco used this bellicose sentiment to fuel its development and become a regional power in Africa where it is pouring billions of dollars in a south-south cooperation scheme that will undoubtedly create wealth for the African Nations and Moroccan people alike. 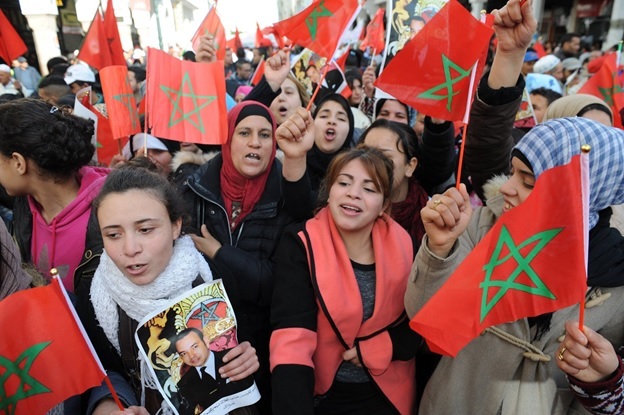 Morocco rode the fearful Arab Spring successfully with Mohammed VI proposing a constitution in 2011 that would ultimately lead to power devolution slowly but surely. Since the Islamists of the Parti de la Justice et Développement -PJD- have been ruling the country on end. Like all the countries of the world, Morocco has its own internal problems, but everything is in the open and everybody knows about everything. Discontent is allowed, as long as it is peaceful. 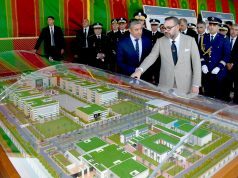 This has happened in Alhoceima with the Hirak, the government responded by firing all the officials that were sluggish in the realization of the development of the region and has earmarked 1 billion dollars for the implementation of social and economic programs . The activists of the uprising have been rounded and imprisoned and are being tried and will soon be sentenced, but everyone knows, deep down, that afterwards they will be pardoned by the king. Another uprising has since occurred in the poor mining city of Jerada in the east, the government is promising to attend to the urgent needs of the population through a development program. In a word Morocco is in perpetual dialogue with itself. Morocco is the most stable country of North Africa, let alone the Arab world. It is currently ruled by the Alouite monarchy that has been around since the 17th century. This dynasty has gained much in historical legitimacy doubled with religious legitimacy because its monarchs besides being the heads of state, the are, also, The Commanders of the Faithful, amir al-mu’mini. The monarchy is sometimes criticized openly, but it is, all the time, held in high esteem and respect because it is the symbol of unity and the strong identity known as tamaghrabit, that binds all Moroccans together be they Amazigh or Arab, Muslim or Jew and poor or rich. Since some time ago, the Polisario, pushed by the Algerian generals has been steadily provoking Morocco, on a daily basis. First they occupied, the Guergrate Border check point hindering the passage of Moroccan trucks into Mauretania. The UN duly chased them out of this place. Now in violation of the 1991 ceasefire they are moving into the buffer zone with their weaponry and trying to build habitations on what they call “liberated territories,” Morocco would not allow this fait accompli and has, as such, informed the UN and Algeria that it will duly kick out the Polisario militarily from the buffer zone, if necessary. 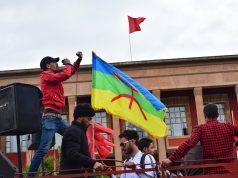 In preparation of this unwanted campaign Morocco is beefing up its forces in the region and strengthening its national front. 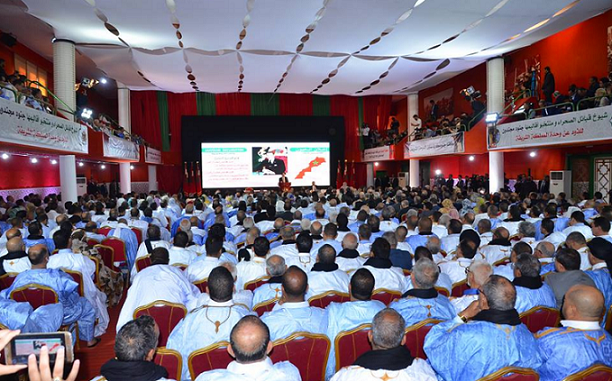 In this regard, the political parties have held a high-profile meeting in Laayoune on April 9, 2018 that has unanimously issued a declaration comprising 15 points stating that Moroccans, one and all, will stand together to defend national territorial integrity. 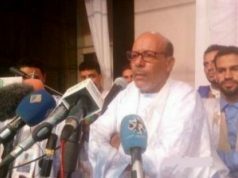 “To condemn Polisario’s actions in the east of Morocco’s defense wall, members of political parties and cabinet officials signed the Laayoune Declaration on Monday, April 9, as part of their meeting in the southern city Laayoune, at the request of Head of Government Saad Eddine El Othmani. Laayoune hosted demonstrations on Sunday and Monday, bringing together leaders of political parties, MPs, elected officials, Cheikhs (tribal leaders), dignitaries and Sahrawi leader-activists, with the aim of showing their mobilization behind the government and their resolve to defend their country’s territorial integrity. “The text summarizes the position of the Moroccan political class, which condemns “the maneuvers of the opponents of our territorial integrity at all levels, especially the latest hostile acts of the Polisario aimed at establishing a new reality on the ground”. The Declaration denounces in this connection the Polisario’s attempt “to transfer certain of its civilian and military elements from Lahmada in Algeria to the buffer zone, with the support of Algiers, in blatant violation of the ceasefire agreement and obvious disregard of the will of the United Nations and the Security Council resolution”. It might be the case that Algeria gripped with so many internal difficulties concerning the economy and the succession or not succession of the incapacitated president, would duly want to export its problems to the region to get some relief from its numerous headaches. But while all Moroccan would volunteer to defend their country, no Algerian would come out in defense of the Polisario Front, especially now. 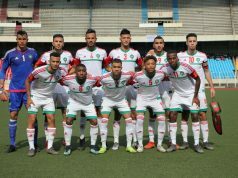 So If I were the Polisario, I would not bank much on Algerian volatile support, instead I will come to Morocco to settle down in the flourishing Sahara region and lead a happy and peaceful life. Will they heed this advice. Only time can show. [i] Full text of the plan: (PDF) (Report). Moroccan Authority. Retrieved 11 November 2016.